Notes: Winner of the 2000 Kobe animation festival for best animated film, this is the final chapter of the wildly popular Card Captor Sakura TV series. As this review discusses events after the TV series, please be aware of spoilers. Now in the 6th grade, Kinomoto Sakura is enjoying life outside of collecting and transforming all the Clow Cards and is participating with her friends in the local school festival play. All is well in these now lazy days up until Li Shaoran suddenly comes back to Japan for a visit. Although surprised by his unexpected arrival, our heroine sees this as the perfect chance to finally respond and reveal her true feelings to him. But when things begin disappearing around town, it seems like doing so might be trickier than she originally anticipated. It's hard to overcome the fact that this movie may simply just be a moneymaking ploy by the producers, but for what it does, it goes beyond that shallow mindset. I'm here to elaborate why. The animation of the movie was once again handled by Madhouse, so it looks great. The general idea is that it looks like the series, but then on a higher budget. Which means you'll instantly recognize everything since the changes are not radical, although the character art is given more of a somewhat dramatic look and feel. The highlight of the animation here is probably the final sequences of fast-paced action, my guess is that it was handled and drawn up by Kawajiri Yoshiaki (X TV). The only thing that really bothered me was the use of still images in some scenes that had a lot of people in it instead of animating everything, which is what higher budgets are for. The music comprises of accentuated orchestral pieces and really fun pop music sung by the cast. If anything, it's on par with whatever the series had to offer. As a bonus, the R1 DVD has an English dub that was probably a reward to the faithful fans that supported Pioneer/Geneon's releases over the years. The dub by Bang Zoom! Entertainment is pretty nice, with Kari Wahlgren (Fuu from Samurai Champloo) as Sakura and Mona Marshall (Toboe from Wolf's Rain) as Shaoran. Other names come up, but I'm particularly fond of Johnny Yong Bosch's (Vash from Trigun) Eriol delivery. The only problem with this is now I wish that the TV series came with an uncut dub, which is probably never going to happen. 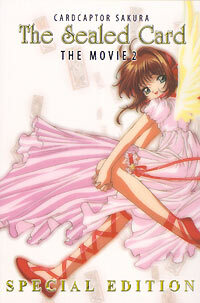 Screenplay writer Ohkawa Nanase (key member of CLAMP) chose to write this version of the ending in a sense that there is still enchantment involved in the plot and a difficult conflict in which the characters will have to gather all their strength once again in order to overcome it, no matter what the cost. Running at the length of 96 minutes, you would think that it'd be somewhat difficult for this movie, especially considering that this is the finale to the series, to effectively break away from what might be a somewhat formulaic tale, but that isn't the case here at all. The movie as a whole is a fun, cute, and emotional journey where we join the characters we have grown to love on one last grand adventure. What helps make the final experience all the more charming is director Asaka Morio's serene pacing in showing us everything from Sakura's normal fun schoolgirl life to the hardship that comes with the responsibility of protecting the people around her. More importantly, I'm very fond of Asaka's treatment of the central message in the film putting great importance on the physical communication of our feelings, symbolizing that not everything can be accurately described in a letter or on the phone. During the movie both of the leads eventually reach a point where they have a tacit acknowledgment of each other's feelings, but then Sakura ultimately cannot communicate her affection since it will just end up hurting the both of them. This is mainly because of the conflict that is put before her in which she has to make an inevitable choice between her feelings and her duty as the master of the cards. The pain that she goes through with the choice that is made remarkably highlights how admirable and strong-willed our little Sakura, who is now growing up, has become. And the final instances of the movie, such a fleeting moment of complete despair that is eventually overshadowed by a climactic turn of events. The powerful symbolic imagery of seeing the sun lighting up the city once again when the worst is over followed by the most adorable final scene coupled with the catchiest music makes for a very satisfying ending that left me utterly breathless. But at the same time, there is this aching bittersweet feeling that just tugs at your heart at the fact that the journey is finally coming to a close. While it does pain me to remember the realization of the series being over every time I see this, the finale is indeed the last hurrah that the TV series so righteously deserves and I couldn't possibly have it any other way. Recommended Audience: Though there is some fantasy violence here, none of it is graphic, and the only true objections to be found are would be the usage of tarot cards and mysticism, and anyone offended by that wouldn't get through the series, much less pick up this movie. Really, there is nothing here that should offend any mainstream audience over the age of seven.